I want to talk a little bit about sugar futures. Recently we have seen some very interesting action in this market. I will be referring specifically to the October sugar futures contract. In the past weeks, we have seen prices go from 19.24 to 22.69. There have been multiple entry opportunities along the way, and as far as I am concerned, the dynamic is not over yet. This morning I am seeing what I believe to be an entry opportunity. I am already long so I will be passing it up, but I would like to talk a little bit about it. Let us first look at a daily chart for the October sugar futures contract. relatively very high compared to their moving average. Why would this be a potential entry point? Wouldn't that just be "chasing high prices"? Potentially yes, and insurance must be taken on a trade like this using stops. Always use stops. However, by looking at price history we can see that prices have, at times, escalated dramatically for weeks on end from high prices like the ones we see today. What differentiates between an opportunity and a threat at times like this? For me, I see this as an opportunity because of what the MACD is doing, and because of what I am seeing in other fundamental data. My fundamental data is telling me to stay long in attitude. 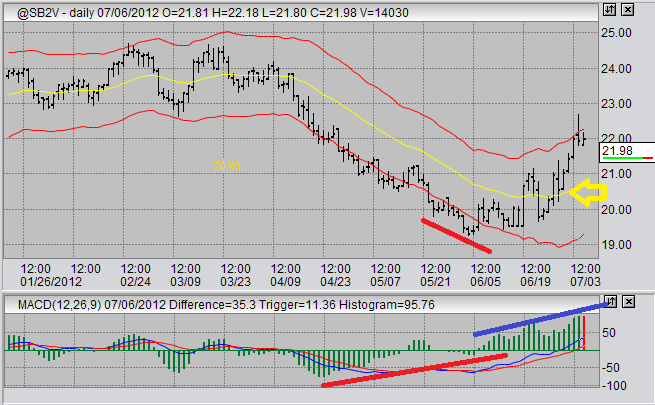 The MACD on the daily chart here is showing higher and higher figures. This tells me there is more upward price movement to come. However, bear in mind, as I am interpreting this situation as an opportunity I am mitigating the potential threat by using protective stops. In this manner my potential for losses are limited by what I decide I want to lose, not what the market decides it will take. Let us now look at the 60 minute chart for the October sugar futures contract to get a deeper look as to why this morning is an entry opportunity. As opposed to say... yesterday morning, or whatever. We can clearly see that prices are in the zone of the moving average, this implies value. Assuming that my daily analysis is correct and we can expect higher prices (even thought we are at a high point relative to the daily moving average), then this is a value entry opportunity as prices are low in a 60 minute perspective. This would be an example of a swing trade using 60 minute charts. Trend is up, prices are low in the zone of the moving average. Again, I've used stops and I will be prepared to exit if price seems as though it will not hold the trend on 60 minute charts. If that occurs, I will be looking for a new entry when prices move closer to the moving average on the daily chart.